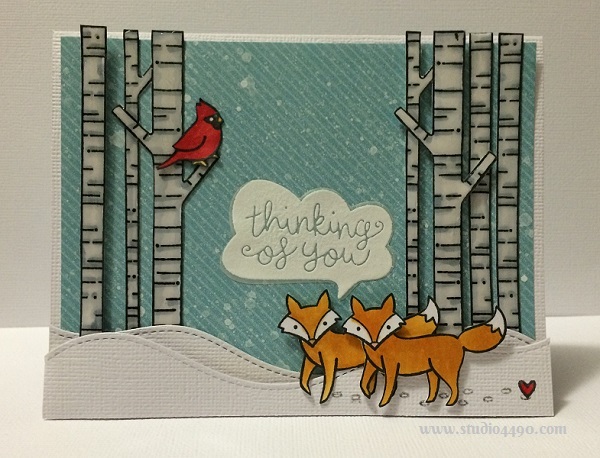 It seems I can’t quite keep away from Lawn Fawn’s new winter releases. Today I have been playing with the Joy to the Woods set. As soon as I saw it I knew I wanted to create a little woodland scene with those stunning birch trees. I coloured the trees with copic markers and put a layer of glossy accents over the top. I love how this looks. The only aspect I had a little trouble with was the sentiment. I was tempted to leave it blank before deciding on a speech bubble from the Chit Chat set. Part of me thinks I should have left it without the sentiment but…what’s done is done. I sprayed the background paper with some “Mister Huey’s Colour Mists” in Opaque White as I wanted to have a more subtle look of falling snow. I love the effect! Oh and how darling are the little “paw prints in the snow”?! What a clever stamp to have included in the set. Materials used: Stamps – Chit Chat, Critters in the Arctic, Joy to the Woods (Lawn Fawn); Dies – Lawn Cuts – Chit Chat, Stitched Hillside Border (Lawn Fawn); Designer Paper – Hello Sunshine 6×6 Paper Pad (Lawn Fawn); Cardstock – Unknown, doodlebug design; Copic Markers, Mister Huey’s Color Mists – Opaque White (Studio Calico); Glossy Accents and Wink of Stella. I really do love the background with the trees so I have started making up another card using the same basic background setting. I love making little scene cards like this so watch out for this card…hopefully I’ll post it tomorrow. Joy IN the woods captured here, Kylie! The foxy pair (with pawprint! ), the trees (gorgeous!! ), the cardinal (pop-of-red-lovely), the signature heart and yes, the puff of air sentiment….a combination that has me swooning. Another card of yours to adore…. Ooh, I love it!!! Joy to the Woods is one of my favorite sets, and you’ve done such a lovely job with it. The trees and the snowbanks are gorgeous, and I adore the fox pair. How cute are they? !